Eggs are my nemesis. I will honestly admit that in the past when I scrambled eggs even the dog turned her nose up at them. If you are like me, do not fear the blasted things – just keep practicing. I finally found something that works for me. Preheat a nonstick skillet on medium low heat. Add 1/2 cup diced ham (I cut up a few pieces of smoked ham sandwich meat). 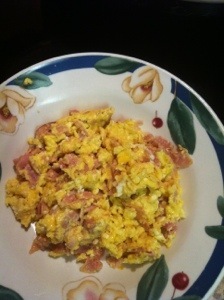 Crack 3 eggs over ham and sprinkle liberally with Beazell’s Cajun Seasoning and a dash of Dat Sauce. Mix well. While eggs are slowly cooking add a handful of shredded cheese. (I added a slice of Swiss cheese on top of eggs and folded in while scrambling eggs). Do NOT cook eggs until dry. You want them a little moist. Also, a medium heat is essential. I have discovered that cooking at a high heat gives you rubbery eggs. 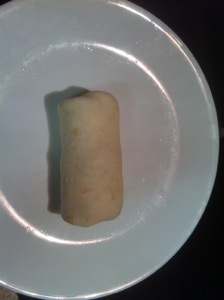 Next, warm the flour tortilla in microwave for about 7 – 10 seconds. I have found that this is the secret to wrapping the tortillas. 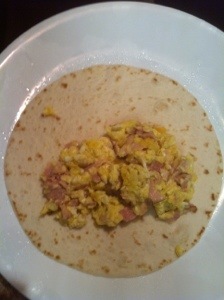 Add eggs to one end of tortilla. Wrap, tucking ends in as you are rolling. The heat from eggs should seal the tortilla up for you.